The Climate Crisis: talk softly and carry a big hockey stick? Michael Mann's hockey stick is arguably the most important hockey stick in the world. While there may be better pieces of sporting kit used to strike pucks into nets, there are few more graphic illustrations of anthropogenic global warming. The power of the hockey stick image is that you don't have to look at it for long to infer the message: mean temperatures have always fluctuated, but over the last half century they have sharply accelerated, begging the question: why? And inviting some version of the answer: because of human activity, particularly our over-use of fossil fuels. 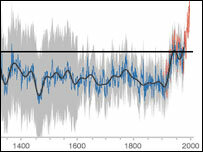 There have been many versions of the hockey stick, which featured in Al Gore's in An Inconvenient Truth and challenged in The Great Global Warming Swindle but the original version can be seen in Mann's co-authored academic paper from 1999(appendices, figure 3) which is an extended version of a Nature paper in 1998. You have to be a highly motivated reader and keen on statistics to fully make sense of the argument, but it sounds like there were good reasons to challenge the data and analysis in which the original hockey stick graph was based. That said, the idea that the hockey stick has been shown to be 'wrong' appears to be unfounded. Although I am at the edge of my competence on this issue, the following balanced article in the New Scientist indicates that the basic argument indicated by the graph still holds: it was much hotter towards the end of the twentieth century than it has been in the last thousand years, and the increase in mean global temperatures is progressive. Graphs and statistics aside, today I read a shocking interview with Mann in the Guardian, detailing his prolonged persecution from climate change deniers(it's not happening at all) and climate change sceptics(it's not happening as much as the scientific consensus suggests and/or it's not caused by human action). I wonder what the future holds for the hockey stick? At a rhetorical level, it is quite powerful because it captures a complex scientific argument in a simple image. However, this particular device has become a bit tainted by critiques, even if they had limited validity, and it also feels somewhat corny, or even lame. And yet the climate crisis has not been particularly salient in recent weeks, not because it has gone away, but because journalists need angles to write stories. The issue may need some fresh mpetus, and so much better if that can be captured in a clear image that makes sense to people. But if not a hockey stick, then what? Can education prevent a future economic crisis? The train seat etiquette crisis: an innovative idea! The RSA has spent 250 years coming up with groundbreaking innovations in the world of "arts, commerce and manufacture" that have huge social benefit. But I think its finest moment has just arrived.